Re: picture in top left corner. I have very clear memories of this trip circa 1968 when I was 4 years old. My dad was still finishing the car on Friday prior to us leaving for Akron and my grandparents on Saturday. I drove the whole way (from Mass) with my dad in this while my mom drove with my little brother in another car following. My brother and I stayed behind in Akron while later in the week my parents completed the drive to Auburn. 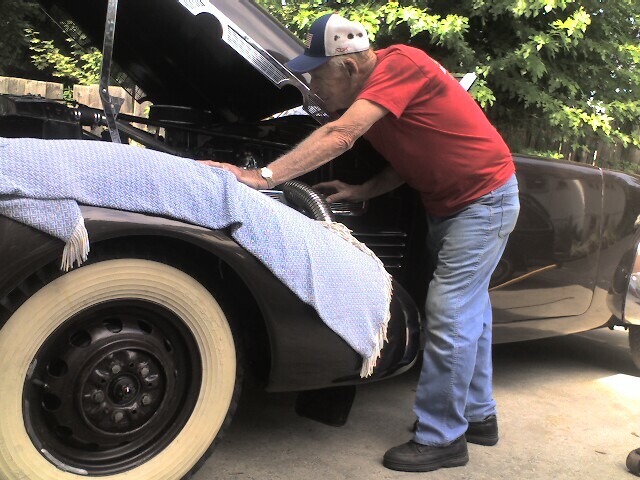 Here is a picture from last summer of the same car with my dad working on it. The paint is still circa 1966 or so.